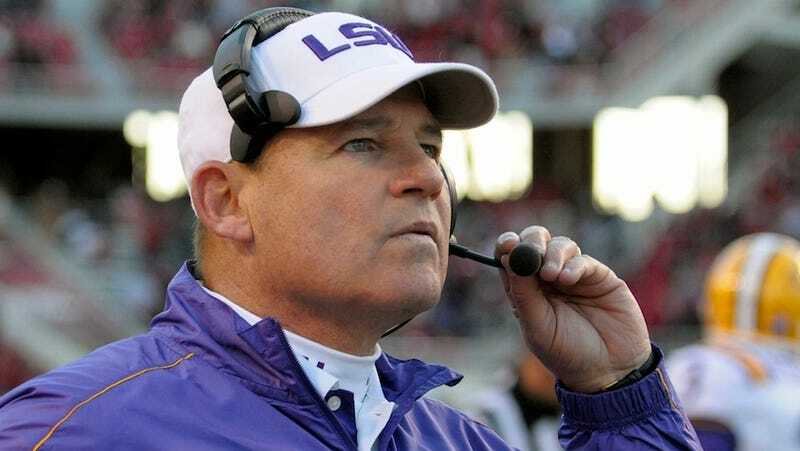 Saturday night into Sunday, it was hard to be online without seeing the big rumor about LSU coach Les Miles. Miles was going to step down at a press conference today, admitting to an affair with a female student. The rumor started gathering details as it rolled—we received an email from someone claiming to have a close friend in the athletic department, claiming the student worked in Miles's office, and they had "seen all the texts and Facebook messages and there [sic] really really raunchy." We see rumors like this all the time, and this one was easy enough to put to bed: a plugged-in reporter quickly shot it down, and LSU announced there was no press conference scheduled. But unlike most false rumors, this one has a face attached: Sam McGaw, the WKU broadcasting student and Bleacher Report contributor who first took it from the dark lands of the message board to the wider Twitter universe. McGaw gradually backpedaled, but it wasn't until eight hours later—well after the rumor was released into the world—that he indicated where he had gotten it—from an Alabama message board, perhaps not the most trustworthy source for LSU news. Message boards are rife with this stuff, and Twitter is full of slander. (Example: all the chatter this morning about a certain NBA superstar and steroids.) But most people know enough to avoid passing it on as anything more than a joke. So while McGaw wasn't the only one tweeting about Les Miles, he was the only one whose Twitter profile indicated a media background, and probably should have known how it would be received. "One lesson was, I'm grateful for my broadcast professors teaching me ethics. I used the world allegedly. I used the word rumors. Making sure that, hey, I'm not just throwing this out of the blue. I'm making sure that I'm not accusing anybody of doing something. I'm just mentioning this is something people are speaking of." He does regret passing it along without sourcing it (especially since the source would have identified it as fiction in the minds of most readers), but honestly can't figure out what he did wrong. In his mind, it still might have been right: McGaw claims he's received two job offers, and his Twitter follower count skyrocketed from 268 to 30,000 in a matter of days. Even so, this might be a clue as to why gossip is so powerful. "Les Miles quitting" existed, online only, for about a day. It wasn't true, but LSU had address it and McGaw's a mini-celebrity this morning. As usual, the only person who benefited from recklessly passing on a rumor was the rumormonger.